Original stories from Fanny Blake, Elizabeth Buchan, Rowan Coleman, Jenny Colgan, Philippa Gregory, Matt Haig, Veronica Henry, Andy McNab, Richard Madeley and John O'Farrell - with special anniversary recipes from The Hairy Bikers. A young woman with memories of D-Day and a life both dangerous and exciting A father and son with a shared birthday and deeply held secrets A single mum taxi driver, whose envy for the rich couple on their way to the Ritz soon changes The unlikely marriage, born in the depths of war The Tudor wife receives the ghostly message, 'Never marry a dangerous man' An agoraphobic widower, unable to visit his wife's grave The Elvis impersonator who finds hope for a new romance with Marilyn Monroe The ex soldiers burdened with the consequences of one bad decision The long-held memories of a wartime tragedy The anniversary supper which changed the world... 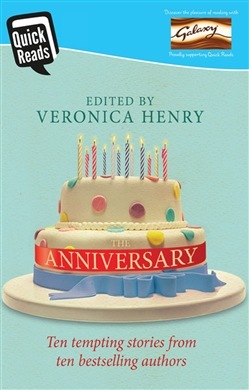 THE ANNIVERSARY - a collection of the very best short fiction around. Acquista The Anniversary in Epub: dopo aver letto l’ebook The Anniversary di Philippa Gregory, Andy McNab, John O'Farrell... ti invitiamo a lasciarci una Recensione qui sotto: sarà utile agli utenti che non abbiano ancora letto questo libro e che vogliano avere delle opinioni altrui. L’opinione su di un libro è molto soggettiva e per questo leggere eventuali recensioni negative non ci dovrà frenare dall’acquisto, anzi dovrà spingerci ad acquistare il libro in fretta per poter dire la nostra ed eventualmente smentire quanto commentato da altri, contribuendo ad arricchire più possibile i commenti e dare sempre più spunti di confronto al pubblico online.